I can still remember the fall of 1991. One our favorite things to do as a family was go to the movies. We loved doing a double feature on a Saturday or catching an evening movie, sometimes even on a school night. 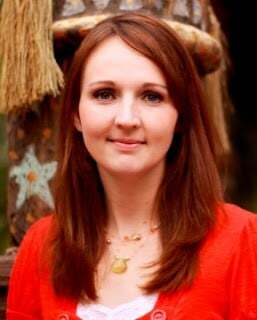 From the earliest I can remember I had a passion for art and because of that, I loved to see animated films. As an eleven year old boy, I was teetering on that age where it was uncool to see Disney films, especially princess films. That fall, we went and saw Disney’s The Beauty and the Beast. It was mind blowing. Never had I experienced an animated film so rich and beautiful. We saw it at least a half dozen times in the theater, not to mention the innumerable times on VHS and DVD over the years. This film, as well as some other films (mostly Disney), that inspired me to pursue animation and a career in the film industry. Here we are, 25 years later, and the film continues to have just as strong of an impact as it did I. That fall back in 1991. 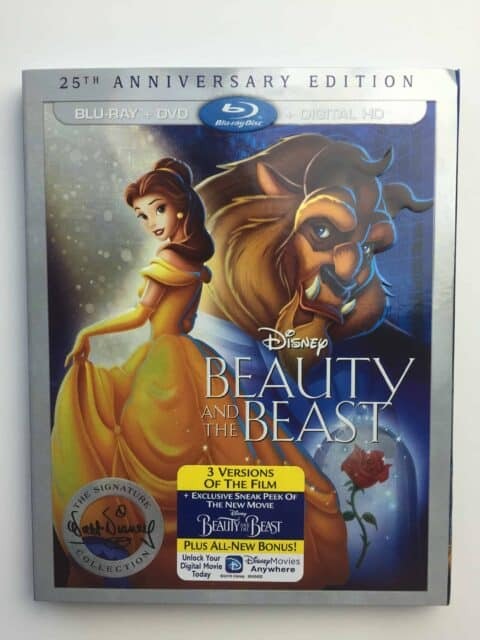 With the 25th anniversary, Disney is releasing a commemorative blu-ray edition of the film. As I would expect it is beautifully mastered and full of wonderful extras, but what I really want to talk about is is this story still pertinent in today’s, “modern and forward thinking,” society. Here are Three life lessons from Beauty and the Beast. The film opens with a cautionary tale of a spoiled prince who shuns an old woman begging for shelter. It is told with story panels of stain-glass windows. What seemed to the prince as a harmless dismissal, resulted in his transformation to the beast, revealing his true internal nature in the form of a beastly exterior. We live in an age where people think less and less of the consequences of their words and actions. The news cycle is filled with politicians, celebrities and other individuals doing damage control for ill expressed sentiments or inappropriate behaviors, for which there image will be forever tarnished. Their inner beast, revealed for all to see, sprawled across the screens of cyberspace. I would suggest we might learn caution and refrain from the prince and seemingly small slight to the old woman. That by compassion and caring for others our inner character will be handsome and beautiful, not deformed and hideous as was the beast. I came across another article about the release of the blu-ray which suggested that the Beast, with his temper and his verbal violence, deserves to be removed from existence. While I agree that his actions were both reprehensible and offensive, but is that not the purpose of characters in film? Do they not provide us with a safe context to explore the human experience and learn and grow as we experience these stories. Never is it portrayed that the Beast’s behavior was acceptable or exemplary. His behavior and character were, in fact, the antagonist of the story. The “beauty” of the story is the transformation and ultimate defeat of that antagonist that takes place as Belle begins to see past the exterior and find the true character within, to find the prince. It was Belle’s acceptance, not of behavior but of the value of him as a being, that allowed the Beast to finish putting aside the part of him, the arrogance, the selfishness, the unloving part of him and find a road to redemption. Do we all not hope that people will see past our exterior faults and weaknesses and see our inner beauty, the inner character we wish to be. Are we not all on a journey of purification and redemption? It is the transformation and the revealing of inner character that makes the beast such a magnificent and fascinating character. Love in today’s world has become about the receiver, about how they feel, what love gives them. Love today is about looks, it’s about wants and goals that align, it’s about convenience. With his goal of being returned to his human form right I front of him, with all things going his way, Beast willing lets go of his own wants, his own goals and gives his wishes over to truly living for another. Beast relinquished his hold on belle to allow her to go to her father, even though it meant most likely never being human again. His needs finally took a backseat to those of his love. He sacrificed his own happiness for the happiness of the one he had learned to love. 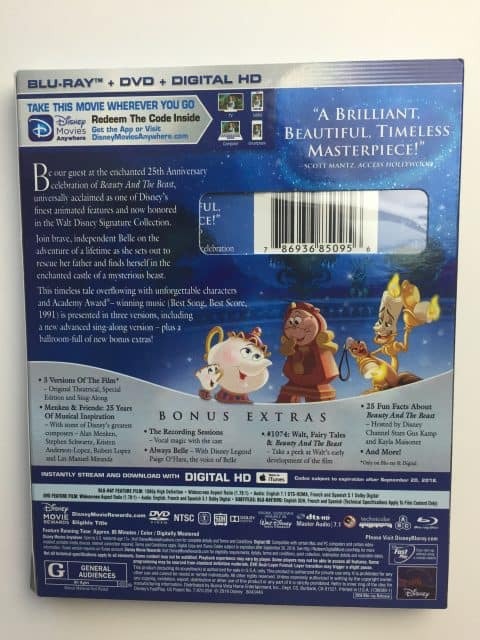 The 25th Anniversary Edition of Disney’s Beauty and the Beast is now available on Blu-ray. This truly is a timeless masterpiece that I love being able to watch with my kids again and again. The story, music, adventure, characters and look and design appeals to kids and adults of all ages. I watched this when I was 11 and now I get to share the love and adventure with my 11 year old. That is the magic of Disney that it lives on through all generations. The Bonus Features are always one of my favorite parts about getting the movie on Blu-ray. I love having the opportunity to learn all of the behind the scenes of making movies. The 25th Anniversary Edition of Disney’s Beauty and the Beast is filled with great special features that help me better enjoy the film and appreciate the heart that went into making it. In the special features you will learn more about the Musical Inspiration of the movie, enjoy different versions of the movie, see behind the scenes in a recording sessions, learn Beauty and the Beast fun facts and see a sneak peek of the new Beauty and the Beast movie that opens in theaters everywhere on March 17th, 2017!